Join our email list to keep you informed on what's available. 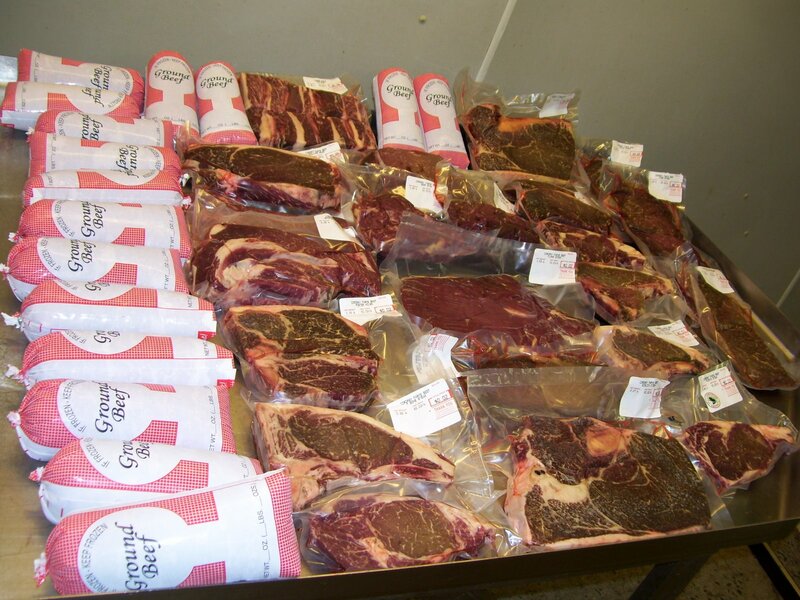 August 15 to January 1st: Stop by our farm store for fresh and frozen beef cuts, summer sausage, beef jerky and more! Jan. 2 to August 14th: We sell our beef by the sides (1/2 cattle) or Shares (1/8 cattle). We keep a list of folks who've reserved their beef and we go down the list as we harvest animals. If you'd like to reserve a Beef Share, send in $100. Sides require a $200 deposit. Contact us for more information. Cordray Farms Beef Shares: Our CSA plan provides for Beef Shares. A Cordray Farms Beef Share is 1/8 of an animal. A share contains standard cuts of steaks, roasts, stew beef, stir-fry, and hamburger. A share is approximately 50 to 55 lbs. When packaged and frozen, that's about 2 of these boxes. We've chosen this size because this much beef will fit easily in the top of most refrigerator freezers. 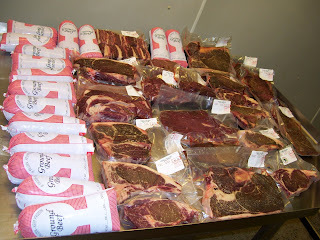 You can have farm raised all natural beef without having to have a deep freezer! Why do we sell Shares instead of the traditional beef quarters? Imagine that you and 7 friends want to equally divide a steer. That way, each family gets cuts from all over the animal. You'll get some from the front quarter, like ribeye steaks and chuck roasts, and some from the hind quarter, like TBone steaks and rump roasts. Every share has about 20 lbs. of hamburger packaged in 1.3 lb. packs. We cut all the steaks about 1.25 inches thick and 2 to 3 lb. roasts. Each share is as close to the same as we can make it! Everything comes vacuum sealed and frozen. It will fill a medium size cooler. Beef Shares are $6.15 per lb. and average about $360 each. To reserve your share, send in your $100 deposit to today! Then, we'll call you to let you know when to stop by and pick up the best tasting beef you've ever had. Shares are cut into standard size cuts to help divide shares evenly. 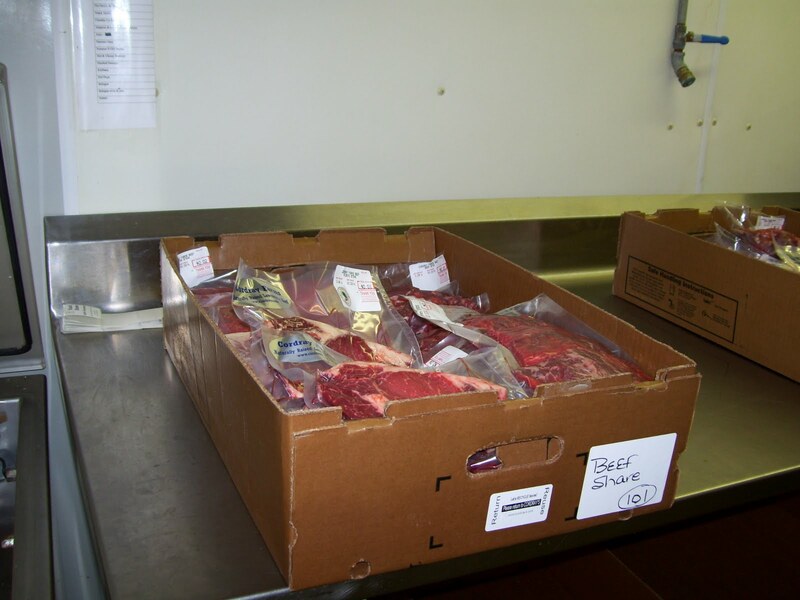 If you're looking for custom cut beef, packaged according to your cutting instructions, please consider a Cordray Farms Beef Side. Call us at 843.766.7922 for more information. If you'd like to receive an email keeping you informed about what we have available, join our email list.